Pin oak (Quercus palustris), also called swamp oak, water oak, and swamp Spanish oak, is a fast-growing, moderately large tree found on bottom lands or moist uplands, often on poorly drained clay soils. Best development is in the Ohio Valley. The wood is hard and heavy and is used in general construction and for firewood. Pin oak transplants well and is tolerant of the many stresses of the urban environment, so has become a favored tree for streets and landscapes. Pin oak grows from southwestern New England west to extreme southern Ontario, southern Michigan, northern Illinois, and Iowa; south to Missouri, eastern Kansas, and northeastern Oklahoma; then east to central Arkansas, Tennessee, central North Carolina, and Virginia (16). -The native range of pin oak. The climate throughout most of the range of pin oak is classified as humid or, in the northwestern portion, moist subhumid. Precipitation varies from 810 mm (32 in) along the western and northern edges of the pin oak range to more than 1270 mm (50 in) in Arkansas and Tennessee. Mean annual temperatures and growing season lengths range from 10° C (50° F) and 120 days in southern New England to 16° C (60° F) and more than 210 days in northern Arkansas and western Tennessee (16). Pin oak grows primarily on level or nearly level, poorly drained alluvial floodplain and river bottom soils with high clay content (order Entisols). Pin oak is usually found on sites that flood intermittently during the dormant season but do not ordinarily flood during the growing season. It does not grow on the lowest, most poorly drained sites that may be covered with standing water through much of the growing season. It does grow extensively on poorly drained upland "pin oak flats" on the glacial till plains of southwestern Ohio, southern Illinois and Indiana, and northern Missouri (order Alfisols). Because of the level topography and presence of a claypan in the soil, these sites tend to be excessively wet in the winter and spring (22). Pin oak is a major species in only one forest cover type, Pin Oak-Sweetgum (Society of American Foresters Type 65), which is found on bottom lands and some upland sites throughout the central portion of the pin oak range (8). Associated species in this type include red maple (Acer rubrum), American elm (Ulmus americana), black tupelo (Nyssa sylvatica), swamp white oak (Quercus bicolor), willow oak (Q. phellos), overcup oak (Q. lyrata), bur oak (Q. macrocarpa), green ash (Fraxinus pennsylvanica), Nuttall oak (Quercus nuttallii), swamp chestnut oak (Q. michauxii), and shellbark (Carya laciniosa) and shagbark (C. ovata) hickories. Pin oak and sweetgum (Liquidambar styraciflua) vary in their relative proportions in this cover type, and large areas of almost pure pin oak occur on the "pin oak flats" of the upland glacial till plains or in the bottom lands of the lower Ohio and central Mississippi River valleys. Pin oak is an associated species in Silver Maple-American Elm (Type 62) in the bottom lands along the Ohio, Wabash, Mississippi, and Missouri Rivers; a variant of this type, silver maple-American elm-pin oak-sweetgum, is found along major streams in southern Illinois and Indiana. Pin oak also occurs in Black Ash-American Elm-Red Maple (Type 39) in poorly drained bottom lands in northern Ohio and Indiana along with silver maple (Acer saccharinum), swamp white oak, sycamore (Platanus occidentalis), black tupelo, and eastern cottonwood (Populus deltoides). Flowering and Fruiting- Pin oak is monoecious; flowers appear at about the time the leaves develop in the spring. Staminate flowers are borne on aments that develop from buds formed in the leaf axils of the previous year, and pistillate flowers are borne on short stalks from the axils of current-year leaves. Pollination is by wind. Fruit is an acorn (nut) that matures at the end of the second growing season after flowering. Acorns are dispersed from September to early December (25). Seed Production and Dissemination- Pin oak stands begin producing seed at about age 20, but open-grown trees may begin at ages as young as 15 years (22,25). During a 14-year period, production of mature acorns in 32- to 46-year-old pin oak stands in southeastern Missouri averaged 210,300/ha (85,100/acre) but varied yearly from 13,300 to 492,700/ha (5,400 to 199,400/acre). Poor acorn crops occurred at 3- to 4-year intervals. Insect infestation rates varied inversely with crop size and, over all years, averaged 26 percent (19). Pin oak acorns are dispersed by squirrels, mice, blue jays, and woodpeckers. Pin oak acorns submerged in cold water as long as 6 months were not damaged. This tolerance may be partly due to a thick, waxy coating on the pericarp that impedes water absorption (5,23). The acorns require stratification of 30 to 45 days at 0° to 5° C (32° to 41° F) to break dormancy, and germination of sound, stratified acorns averages about 68 percent (30). Seedling Development- Germination is hypogeal (22). Pin oak seedlings established after good seed years are often abundant. In southeastern Missouri, an average of 8,650 new seedlings per hectare (3,500/acre) were present the summer following a good seed year. Seedling establishment rates were higher on areas that had been scarified the previous summer than on undisturbed areas. In an adjacent area that had been artificially flooded for 3 months during the winter, almost no new seedlings developed, partly because many of the acorns were consumed by thousands of migrating ducks attracted to the flooded area during the winter (23). Although large numbers of seedlings can become established after good seed years, under fully stocked stands most die within 5 years because of their shade intolerance. Even under these conditions, however, a few individuals may live as long as 30 years, although they grow very slowly and frequently die back and resprout (22). When established first-year seedlings are subjected to shallow flooding (tops and leaves above water) during the growing season, root growth ceases, some secondary roots die, and almost no adventitious roots are formed. Although growth during flooding is poor and recovery after flooding may be slow, seedling survival to such shallow flooding for as long as 84 days is high (7). Pin oak seedlings survive complete inundation (tops and leaves under water) for only 10 to 20 days during the growing season. They are classified as intermediate in tolerance to growing season shallow flooding along with cottonwood, sycamore, and silver maple; but they are less tolerant than water tupelo (Nyssa aquatica), green ash, and black willow (Salix nigra) (13,14). Neither shallow flooding nor complete inundation during the dormant season has an adverse effect on pin oak seedlings (4). Vegetative Reproduction- Pin oak sprouts vigorously from stumps of young trees, and, if the origin of the sprouts is low on the stump, the incidence of decay from the parent stump is low. After physiological die-back or injury to the top, young seedlings sprout readily from dormant buds on the stem or root collar (22). Growth and Yield- Pin oak grows rapidly. In well-stocked, even-aged bottomland stands in southeastern Missouri, pin oak crop trees averaged 28 cm (11 in) in d.b.h. and 20 rn (65 ft) in height at age 30, and more than 40 cm (16 in) in d.b.h. at age 50. On good bottomland sites, stands normally reach heights of 24 to 27 m (80 to 90 ft) and diameters of approximately 60 cm (24 in) by 75 years, and individual trees may eventually attain heights of 37 m (120 ft) and diameters of 150 cm (60 in) (22,26). Pin oak responds rapidly to thinning. After release, pin oak crowns expand quickly to occupy the additional growing space, and diameter growth increases rapidly. Net annual growth on plots thinned at age 37 in southern Illinois was 8.8 m³/ha (125 ft³/acre). At age 40 these stands had 42.0 m³/ha (3,000 fbm/acre) in trees 27 cm (10.6 in) in d.b.h. and larger and were growing at a rate of 4.2 m³ to 7.0 m³/ha (300 to 500 fbm/acre) per year. Typical 60- to 70-yearold bottomland pin oak stands yield 112 to 168 m³/ha (8,000 to 12,000 fbm/acre) of merchantable sawtimber. Growth of pin oaks on upland till-plain sites is much less than on bottom-land sites (22). Pin oak is a short-lived species and reaches physiological maturity at 80 to 100 years. Little is known about maximum ages attained, but in one old-growth stand in Kentucky trees averaged 138 years of age (6,22). Pin oak is strongly excurrent in growth form, and even open-grown trees maintain a well-defined main trunk through most of the crown. Trees grown in forest stands have narrow -crowns, but open-grown trees develop wide, symmetrical crowns in which the upper branches bend upward, the midcrown branches are horizontal, and the lower branches bend downward. This characteristic branching habit gives the tree a distinctive pyramidal shape. Pin oak is not self-pruning. Many of the lower bole branches remain alive on open-grown trees, and although most of these branches die in closed stands, the dead branches are retained for many years. This characteristic causes many small "pin knots" in the lumber and gives the species its common name. (Some authorities ascribe the derivation of the common name to the prevalence of short, pinlike branches on the main lateral limbs (11)). Pruning removes these lower branches, but its benefit is partially offset by the subsequent development of new epicormic sprouts. Twelve years after the first 4.9-m (16-ft) log was pruned on 30-year-old trees in evenaged stands in southeastern Missouri, pruned trees have less than one-fourth as many branches as unpruned trees (6.1 compared to 25.6 branches) (18). Rooting Habit- In well-aerated soils, pin oak seedlings initially develop a strong taproot. As the trees become older, however, the root system loses this configuration and becomes more fibrous. When transplanted, bare-root seedlings and small saplings of pin oak quickly regenerate an extensive, fibrous root system (7,24). Reaction to Competition- Pin oak is classed as intolerant of shade. It is less tolerant than elm, boxelder (Acer negundo), sweetgum, hackberry (Celtis occidentalis), and ash but is more tolerant than eastern cottonwood and black willow. Pin oak usually grows in even-aged stands of dominant and codominant trees; intermediate and suppressed trees in such stands usually die within a few years of being overtopped. Single pin oaks in mixed stands usually are dominants. Pin oak is considered a subclimax species; it persists, however, on heavy, wet soils because it produces an abundance of reproduction which, if released, grows faster on these sites than most of its competitors (22,29). Damaging Agents- Although pin oak is very tolerant of dormant-season flooding, it is much less tolerant of growing-season flooding and trees may be injured or killed by intermittent growing-season flooding over several successive years. The trees can usually survive one growing season of continuous flooding but will be killed by continuous flooding over 2 or 3 consecutive years (2,4,10,22). Pin oak is rated as "intermediately tolerant" to growing season flooding, along with such species as sugar maple (Acer saccharum), river birch (Betula nigra), southern red oak (Quercus falcata), and Shumard oak (Q. shumardii); it is less tolerant than red maple, silver maple, sweetgum, sycamore, swamp white oak, and American elm (tolerant) and eastern cottonwood, green ash, and black willow (very tolerant) (28,29). Dormant-season flooding for 20 years in a greentree reservoir in southeastern Missouri did not appear to damage pin oak trees, but did reduce stand basal area growth by 10 percent (26). However, in this same area approximately 5 years later (i.e., after 25 years of flooding), many, of these trees had developed bole swellings at and just above the average flood water level. These swellings caused longitudinal fissures in the bark up to 10 cm (4 in) wide, thereby exposing the bole xylem to decay organisms. The cause of this phenomenon is unknown, but it appears to be associated with the continuous dormant-season flooding, because pin oaks in adjacent areas subject only to intermittent natural flooding were not similarly affected (27). The bark of pin oak is relatively thin and the species is therefore especially susceptible to damage by fire and the decay associated with fire wounds (12,22). Pin oak is subject to most of the diseases of oaks including oak wilt (Ceratocystis fagacearum) and is particularly susceptible to a leaf blister fungus (Taphrina caerulescens), a shoot-blight and twig canker fungus (Dothiorella quercina), and pin oak blight (Endothia gyrosa) (12). Pin oak is also host to many of the common oak-feeding insects including many defoliators, wood borers, gall wasps, and acorn weevils. Pin oak is classified as a "most preferred" host for gypsy moth (Lymantria dispar) (15), and is also especially susceptible to the obscure scale (Melanaspis obscura), oak leaftier (Croesia semipurpurana), pin oak sawfly (Caliroa lineata), scarlet oak sawfly (C. quercuscoccineae), the sawfly Calinoa petiolata, the forest tent caterpillar (Malacosoma disstria), a leafroller (Argyrotaenia quercifoliana), the homed oak gall wasp (Callirhytis cornigera), and the gouty oak gall wasp (C. quercuspunctata). Thousands of acres of pin oak stands in southern Illinois have been severely damaged over the past 25 years by outbreaks of the horned oak gall wasp and the forest tent caterpillar (1,31,32,33). Ornamental pin oaks planted on alkaline soils often develop foliar chlorosis (yellowing) which, if severe, can kill the tree. This chlorosis was previously thought to be a simple iron deficiency, but recent research has indicated that it is a more complex phenomenon involving reduced foliar concentrations of one or more of the micronutrients Fe, Mn, or Zn, often in association with increased foliar concentrations of one or more of the macronutrients P, K, or Mg. In most cases, this problem can be easily corrected by soil applications of sulfuric acid. Chlorosis is not a problem in natural stands of pin oak which occur on more acidic soils (20,21). Pin oak acorns are an important food for mallards and wood ducks during their fall migration. Pin and other bottom-land oaks are the primary tree species in bottom-land duck-hunting areas (greentree reservoirs) that are artificially flooded during the fall and winter to attract migrating waterfowl (19). Pin oak acorns are also an important food for deer, squirrels, turkeys, woodpeckers, and blue jays. The wood of pin oak is similar to that of northern red oak, and pin oak lumber is marketed under the general designation of "red oak." The occurrence of numerous small knots in the wood of many pin oak trees limits its use for high quality products, however (11). Pin oak transplants well, and because of its rapid growth, large symmetrical crown, and scarlet fall colorations, it is commonly planted as a shade or ornamental tree (24). No races or genetically distinct populations have been defined within pin oak, but the existence of such populations has been suggested based on differences in flood tolerance and resistance to iron chlorosis (3,9). Five hybrids of pin oak are recognized (17): Quercus x mutabilis Palmer & Steyerm. (Q. palustris x shumardii), Q. x vaga Palmer & Steyerm. (Q. palustris x velutina), Q. x schochiana Dieck (Q. palustris x phellos), Q. x columnaris Laughlin (Q. palustris x rubra), and an unnamed hybrid with Q. coccinea. Baker, Whiteford L. 1972. Eastern forest insects. U.S. Department of Agriculture, Miscellaneous Publication 1175. Washington, DC. 642 p.
Bell, D. T., and F. L. Johnson. 1974. Flood-caused tree mortality around Illinois reservoirs. Transactions of the Illinois Academy of Science 67:28-37. Berrang, P., and K. C. Steiner. 1980. Resistance of pin oak progenies to iron chlorosis. Journal of the American Society for Horticultural Science 105:519-522. Black, R. A. 1980. The effects of flooding on pin oaks in southeastern Missouri. Unpublished report. Bonner, F. T. 1968. Water uptake and germination of red oak acorns. Botanical Gazette 129:83-85. Bryant, W. S. 1978. An unusual forest type, hydromesophytic, for the Inner Blue Grass Region of Kentucky. Castanea 43:129-137. Dickson, Richard E., John F. Hosner, and Neil W. Hosley. 1965. The effects of four water regimes upon the growth of four bottomland tree species. Forest Science 11:299-305. Gill, C. J. 1970. The flooding tolerance of woody species-a review. Forestry Abstracts 31:671-688. Hall, T. F., and G. E. Smith. 1955. Effects of flooding on woody plants, West Sandy dewatering project, Kentucky Reservoir. Journal of Forestry 53:281-285. Harrar, E. S. 1963. Pin oak Quercus palustris Muenchh. In Encyclopedia of American woods, vol. 3. p. 129-136. Robert Speller & Sons, New York. Hepting, George H. 1971. 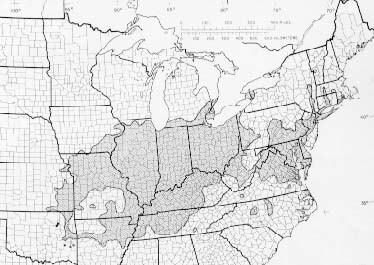 Diseases of forest and shade trees of the United States. U.S. Department of Agriculture, Agriculture Handbook 386. Washington, DC. 658 p.
Hosner, J. F. 1960. Relative tolerance to complete inundation of fourteen bottomland tree species. Forest Science 6:246-251. Hosner, John F., and Stephen G. Boyce. 1962. Tolerance to water saturated soil of various bottomland hardwoods. Forest Science 8:180-186. Houston, D. R., and H. T. Valentine. 1986. Classifying forest susceptibility to gypsy moth defoliation. U.S. Department of Agriculture, Agriculture Handbook 542. 18 p.
Little, Elbert L., Jr. 1971. Atlas of United States trees, vol. 1. Conifers and important hardwoods. U.S. Department of Agriculture, Miscellaneous Publication 1146. Washington, DC. 9 p., 313 maps. Little, Elbert L., Jr. 1979. Checklist of United States trees (native and naturalized). U.S. Department of Agriculture, Agriculture Handbook 541. Washington, DC. 375 p.
McQuilkin, Robert A. 1975. Pruning pin oak in southeastern Missouri. USDA Forest Service, Research Paper NC-121. North Central Forest Experiment Station, St. Paul, MN. 5 p.
McQuilkin, Robert A., and R. A. Musbach. 1977. Pin oak acorn production on green tree reservoirs in southeastern Missouri. Journal of Wildlife Management 41:218-225, 597. Messenger, A. Steven. 1983. Soil pH and the foliar macronutrient/micronutrient balance of green and interveinally chlorotic pin oaks. Journal of Environmental Horticulture 1:99-104. Messenger, S. 1984. Treatment of chlorotic oaks and red maples by soil acidification. Journal of Arboriculture 10(4):122-128. Minckler, Leon S. 1965. Pin oak (Quercus palustris Muenchh.). In Silvics of forest trees of the United States. p. 603-606. H. A. Fowells, comp. U.S. Department of Agriculture, Agriculture Handbook 271. Washington, DC. Minckler, Leon S., and R. E. McDermott. 1960. Pin oak acorn production and regeneration as affected by stand density, structure, and flooding. University of Missouri Agricultural Experiment Station, Research Bulletin 750. Columbia. 24 p.
Moser, B. C. 1978. Progress report-research on root regeneration. p. 18-24. New Horizons Horticultural Research Institute, Washington, DC. Olson, David F., Jr. 1974. Quercus L. Oak. In Seeds of woody plants in the United States. p. 692-703. C. S. Schopmeyer, tech. coord. U.S. Department of Agriculture, Agriculture Handbook 450. Washington, DC. Rogers, Robert, and Ivan L. Sander. 1989. Flooding, stand structure, and stand density and their effect on pin oak growth in southeastern Missouri. In Proceedings of The Fifth Biennial Southern Silviculture Research Conference, p. 299-320. USDA Forest Service, General Technical Report SO-74. Southern Forest Experiment Station, New Orleans, LA. Smith, Desmond E. 1984. The effects of greentree reservoir management on the development of basal swelling damage and on the forest dynamics of Missouri's bottomland hardwoods. Dissertation (Ph.D.). University of Missouri-Columbia. 126 p.
Teskey, R. 0., and T. M. Hinckley. 1977. Impact of water level changes on woody riparian and wetland communities. vol. 3. The central forest region. U.S. Department of the Interior, Fish and Wildlife Services, FWSOBS-7760. Washington, DC. 36 p.
Teskey, R. 0., and T. M. Hinckley. 1978. Impact of water level changes on woody riparian and wetland communities. vol. 4. Eastern deciduous forest region. U.S. Department of the Interior, Fish and Wildlife Service, FWSOBS-7887. Washington, DC. 54 p.
U.S. Department of Agriculture, Forest Service. 1948. Woody-plant seed manual. U.S. Department of Agriculture, Miscellaneous Publication 654. Washington, DC. 303 p.
U.S. Department of Agriculture, Forest Service. 1985. Insects of Eastern forests. Miscellaneous Publication 1426. 608 p.
White, William B. 1969. Forest tent caterpillar defoliation survey on the Oakwood Bottoms, Shawnee National Forest, 1969. USDA Forest Service, Northeastern Area State and Private Forestry, D-8-69. 2 p.
Whyte, G. Lynne, and Robert P. Ford. 1980. Damage appraisal of horned oak gall on pin oak in Oakwood Bottoms greentree reservoir, Shawnee National Forest, 1979. USDA Forest Service, Northeastern Area State and Private Forestry; Damage Appraisal NA-FB/P-9. 4 p.